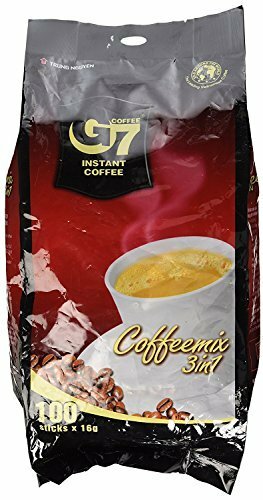 G7 3-in-1 Gourmet Instant Coffee has become SE Asia's most popular instant. Developed at a $10 million plant in the Buon Me Thuot highlands, this gourmet instant is never brewed, never freeze-dried or concentrated. With non-dairy creamer and sugar, this is an instant coffee all ready to go just by adding 6 ounces of hot water. Millions of G7 fans carry G7 with them to be able to make a perfect cup of coffee anywhere, any time. Creates a 6 ounce cup depending on the strength you prefer. 16 gram serving, 100 servings per bag. This is the original blend of G7 from Vietnam and has a stronger, more robust flavor than the new version. Original version is more expensive than the cheaper new version because of premium ingredients. Original Version has different packaging than the new version. Make note of the "special" signage on the front of the packaging. If you have any questions about this product by Trung Nguyen, contact us by completing and submitting the form below. If you are looking for a specif part number, please include it with your message.